About 1 year and a half ago I shared with you my very ugly kitchen: my kitchen needs a makeover. 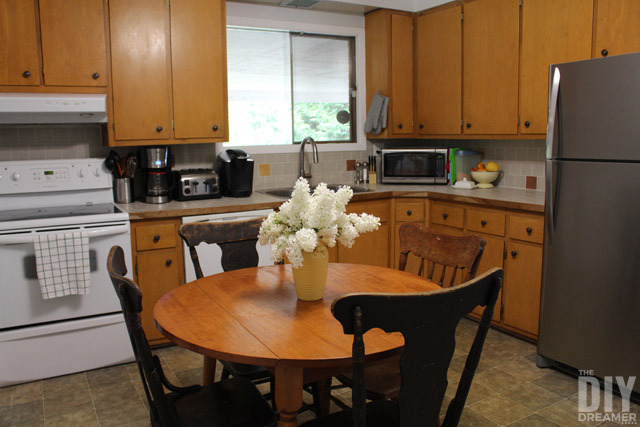 The kitchen hadn’t changed since the house was built in 1960. We had major plans for it when we bought the house 8 years ago, however the house needed more attention in other areas. 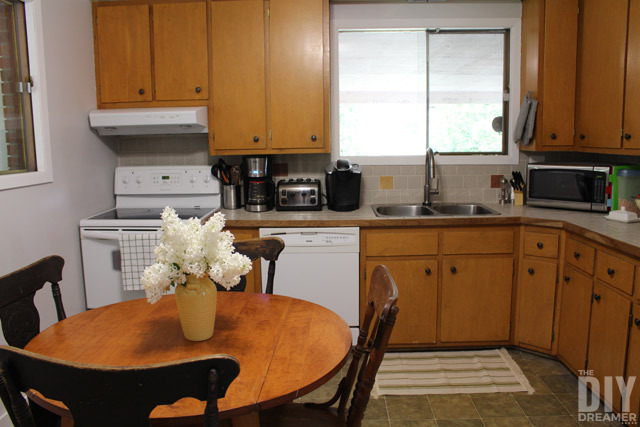 I’d love to say that we have finally got around to giving our kitchen an entirely new look, but that’s not the case. 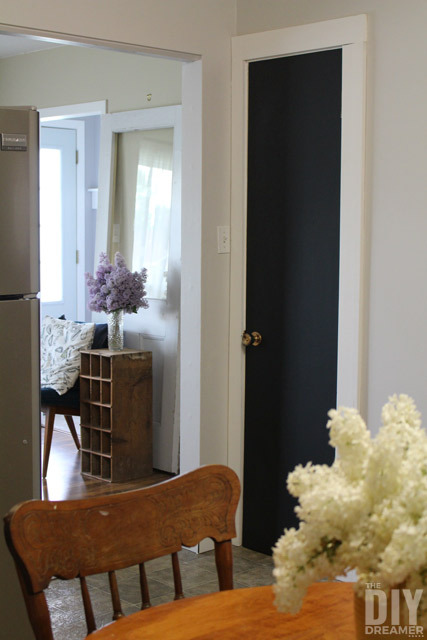 A complete kitchen makeover costs a lot of money and unfortunately we just don’t have the budget for that right now. 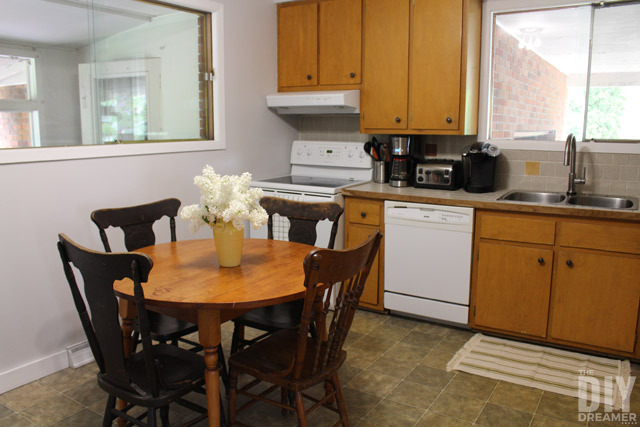 However, we decided to give our kitchen a new look with a one step at a time approach. Meaning we will gradually give our kitchen a new look instead of doing it all at once. We figure instead of waiting until we have all the budget we need, we’ll just do upgrades as we can afford them, even if certain upgrades don’t occur in the perfect order. Yes, it’s ok to say yuck. It’s not like I liked my kitchen. I just made due with what we had. Anyways, here are a few things we’ve done so far to update the kitchen. 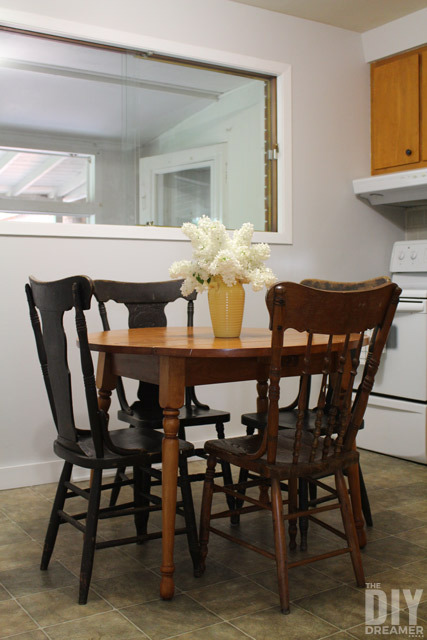 We got rid of our big old dining set. We replaced it with a round table and antique chairs. We removed the wood shelves from the wall. Removed the lace window curtains. Fresh paint on the walls. Bye Bye Ugly Yellow! Hello Beautiful Statuesque! Painted all the trims in white. 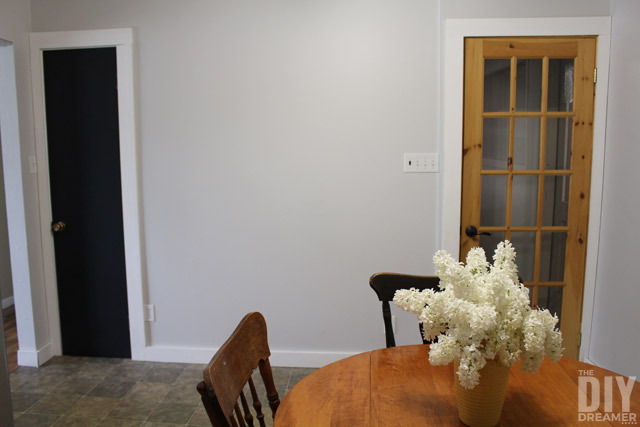 Transformed our closet door into a chalkboard door. New fridge, microwave, and coffee maker. New faucet. We upgraded to a Delta Touch2O Faucet – Trinsic Single Handle Pull-Down Kitchen Faucet Featuring Touch2O® Technology in Arctic Stainless. Our old faucet hasn’t been working like it should for years! We had been holding off changing our faucet until we changed the counter and sink. However, our faucet just didn’t work like it should. It only had pressure if it was placed in the middle of the sink (not convenient when washing and rinsing dishes), it would change temperatures by itself (it would go from cold to hot), water would leak from the faucet handle, etc.. Yes, we need a new sink and a new counter, however sometimes you need to change things now and not wait until you can afford to change things around it. This is especially true when it’s something you use many times throughout the day. We can always uninstall the faucet when we get our new sink and counter and reinstall it. As you can see, we really did need to change our faucet. The thing was no fun to use. Change the hardware throughout the kitchen. New flooring. Our linoleum flooring is stained and ripped in two places from moving out our old fridge. Install new lighting. I bought beautiful industrial pendant lights. Paint the round table and the non-matching chair. 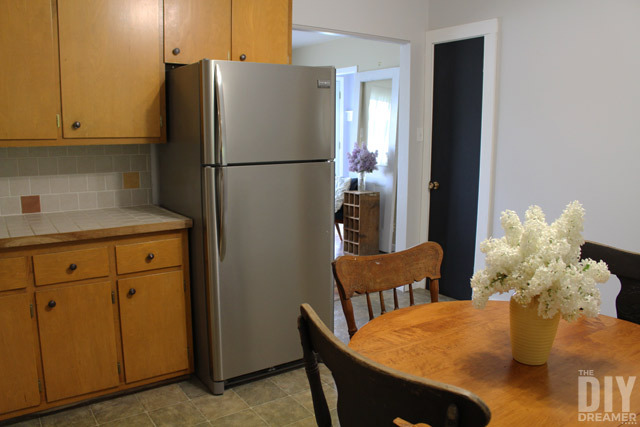 Get stainless steel stove, dishwasher, and range hood to match the fridge. I think I’ll paint the table and the non-matching chair next. I’ll be painting the chair with a colour that matches the others. I’m not quite sure what colour I should paint the table though. What do you suggest? I wish I would just start painting the cupboards already, I keep putting it off. Why? Because I’m pretty sure it’s going to be a big job. We have a lot of cupboards to fix before we can even think about painting. I should get working on them though, I’ve had the paint sitting in my basement for a couple of months now. Oh and we’ll most probably install the new lighting soon too! I have both lights begging me to install them. So, what do you think of the progress we’ve made in the kitchen? Do you like the new wall colour? How about the awesome faucet we installed? Disclosure: Although this post has been generously sponsored by Delta Faucet, the opinions and language are my own, and in no way do they reflect Delta Faucet. Previous Post: « Let’s Party Together! From Dream To Reality 169! Looking so great Christine! I love the colour of your walls, and your new faucet! We too have the Delta Touch2O Faucet and we love it! Such a great addition to our kitchen as well! I like your Delta faucet a lot. It looks so nice in your kitchen. Nice flowers also. Oh my goodness, do we need a new faucet! Our kitchen is in a similar slow process of renovation, but I think the faucet needs to be priority #1 since ours has tiny holes eaten through it by the minerals in our water (yes, really!) and slowly leaks whenever it’s turned on! That Delta touch faucet is definitely on my wish list! looks so great! good luck with the rest of the project – you’ll be so glad you put the effort in:)! Oh I want that faucet so bad! It is so, so cool! It’s amazing how simply updating the kitchen faucet can make your kitchen feel “better!” We just updated our faucet to the same Trinsic model (without the touch feature) and I instantly fell in love with my kitchen again! Can’t wait to see more of your kitchen progress! That’s a beautiful faucet, I’m in the precess of looking for a new one for my kitchen too! I’ll have to check it out. We have a similar list for our kitchen too and just recently replaced the faucet which was leaking so badly the water company called to let us know! very cool faucet, can’t wait to see the progress!!! Looks like it’s coming along great! Can’t wait to see the finished project! What fun to see how your kitchen is coming along. We take that approach too and just chip away at improvements in our home. The faucet is pretty nifty. How convenient when your hands a sticky with cookie batter to be able to turn the faucet on without having to touch it. I have to admit the beautiful white lilacs (I think that is what they are) really caught my eye. Are they from your yard? Also, keep us posted when you get your new lighting. Looking forward to seeing what you choose! It’s a ling list but I am pretty sure it will be a great transformation! Can’t wait! Love the changes you’ve made!! 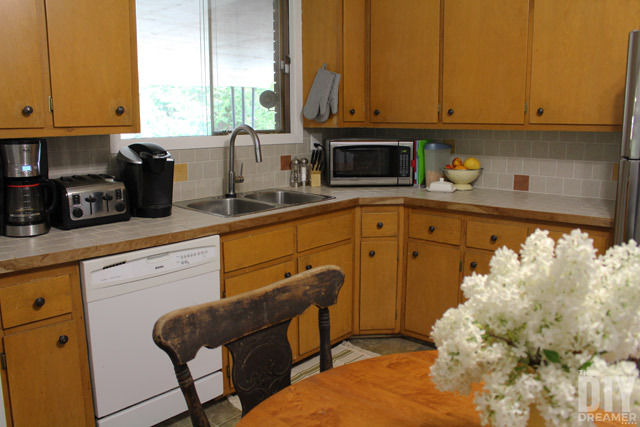 We are in the midst of a long kitchen update – painted the kitchen, new floor, new wall details, new lighting, etc……Finally got the new granite countertops, sink and faucet this spring after 2 1/2 years, but still have to do the backsplash. THEN and only then will I be able to put it on the blog as a final transformation. Patience, patience, patience when doing this sort of thing. The faucet is such a big improvement! Painting the cabinets is a big job, but we have painted the cabinets in every house we have lived in (even our rental:) and it is well worth the effort. You will be shocked by how much more you love your space after! Good luck! 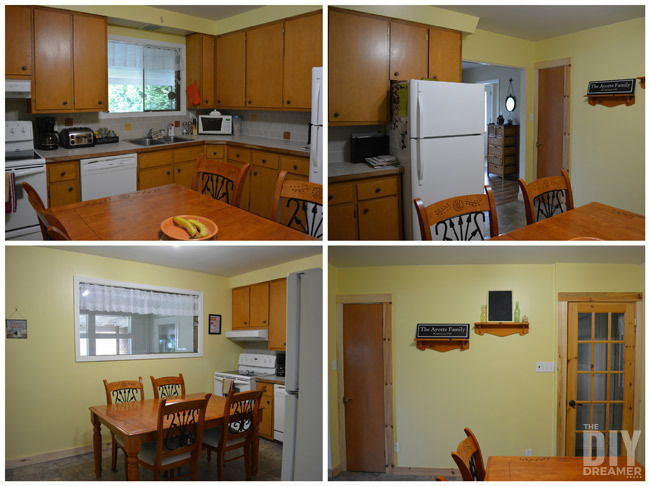 Once those cupboards are painted Christine – it’ll look like a new kitchen ! Such an easy fix – you could even add molding ! Looks good so far! I am kind of working on the same plan, one thing at a time. I am planning on painting the cupbards this summer and go from there. Thanks for the inspiration! Looking great! Makovers a piece at a time are so rewarding when the puzzle starts to come together! 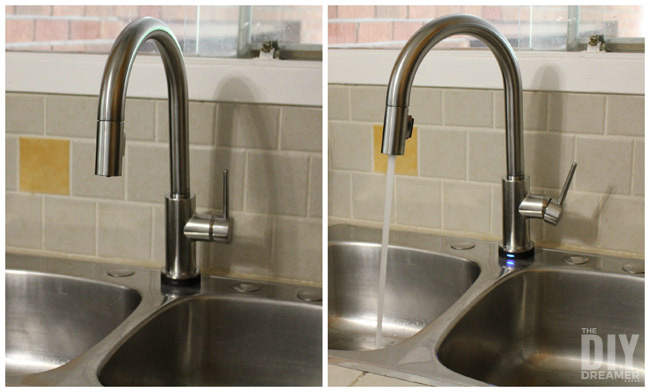 I have a touch 2o faucet and we Love it! What a great faucet….and I can’t wait to watch as you do more….great approach and so realistic. Looking good. Love the new paint color. Isn’t paint just the best? It always has a way of making things look so fresh and new. I’m glad you shared your room with us it’s helps those of us who don’t have such a huge, new, fancy kitchen and a large budget to know we are not alone in this world..hahaha. The halfway-kitchen looks great; can’t wait to see the finished product! 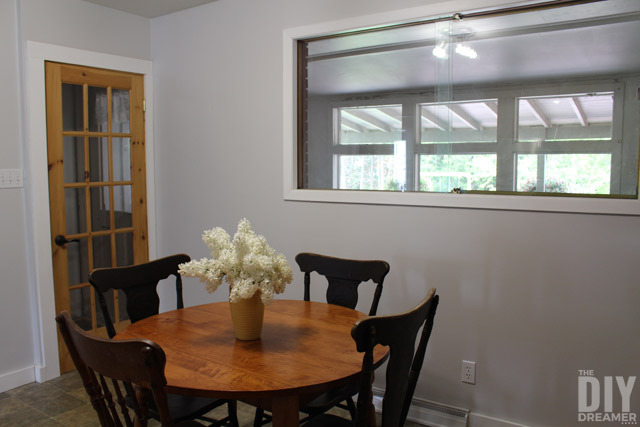 In love with the circular table – it’s more family friendly and frees up so much space!